As a pregnant mama, I love to save time where I can when I’m cooking, I also love to get Emily involved in the cooking process. I have found that with a fussy eater, it is so much easier to show her what I am making, and let her help where she can. That way she will actually be more tempted to try it and get involved. 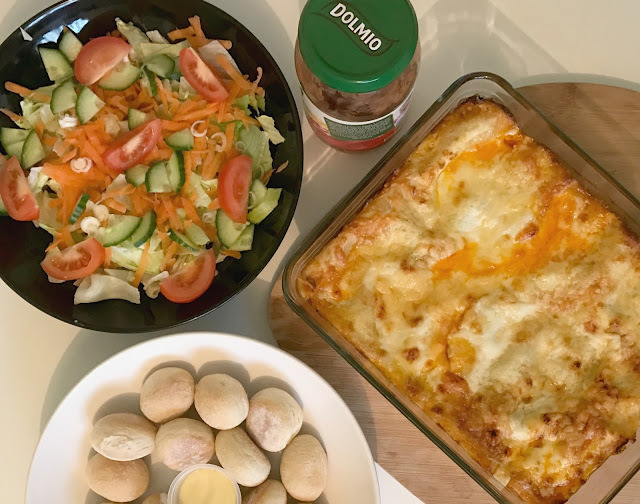 I often find myself reaching for Dolmio sauces when we are doing our grocery shop, they have always been a brand that I have used, and I especially love their lasagne white sauce. When we were given the opportunity to join in with the Dolmio #ThankGoodness challenge, of course we jumped at the chance. We received a delivery of ingredients to get us started, and I knew straight away a lasagne was what I wanted to make, so in addition to the bolognese sauce I headed out to pick up a white sauce to go with it. Most people dismiss jars of sauce, thinking they contain lots of sugar – but I really urge you to have a little look at the label. Did you know in each jar you’ll find at least 10 juicy diced tomatoes, a dollop of tomato puree, half an onion, a tablespoon of sunflower oil, a couple of cloves of garlic, a handful of herbs including basil, a teaspoon of cornflour, a teaspoon of salt, a pinch of pepper, two teaspoons of added beet sugar for taste, a squeeze of lemon juice, a splash of water and nothing more. That’s absolutely no artificial colours, flavours, preservatives or sweeteners. 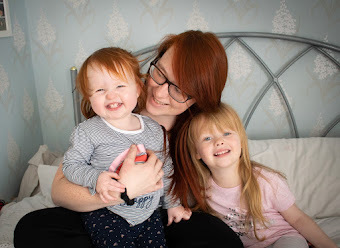 Just 100% natural ingredients – which also provides a family of four with one of their That’s absolutely no artificial colours, flavours, preservatives or sweeteners. Just 100% natural ingredients – which also provides a family of four with one of their 5-a-day each! Now I’m sure your thinking, why use a Bolognese sauce instead of the red lasagne sauce. The answer is simple – as a mother of a fussy eater, I always struggle to get Emily to eat veggies, or anything that she can see bits in. 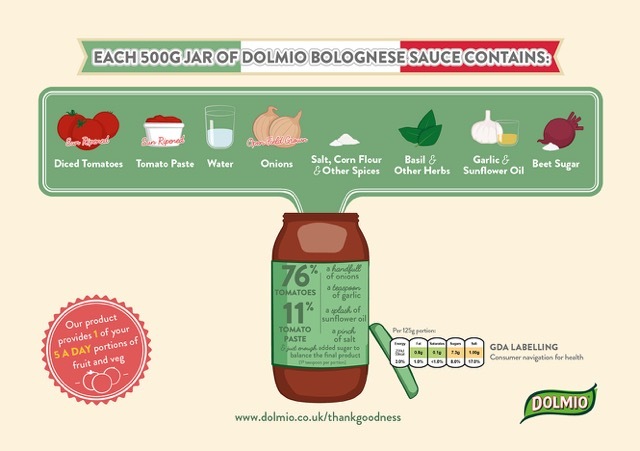 Dolmio do a bolognase sauce that is smooth! Meaning Emily doesn’t give it a second thought, she just eats its. 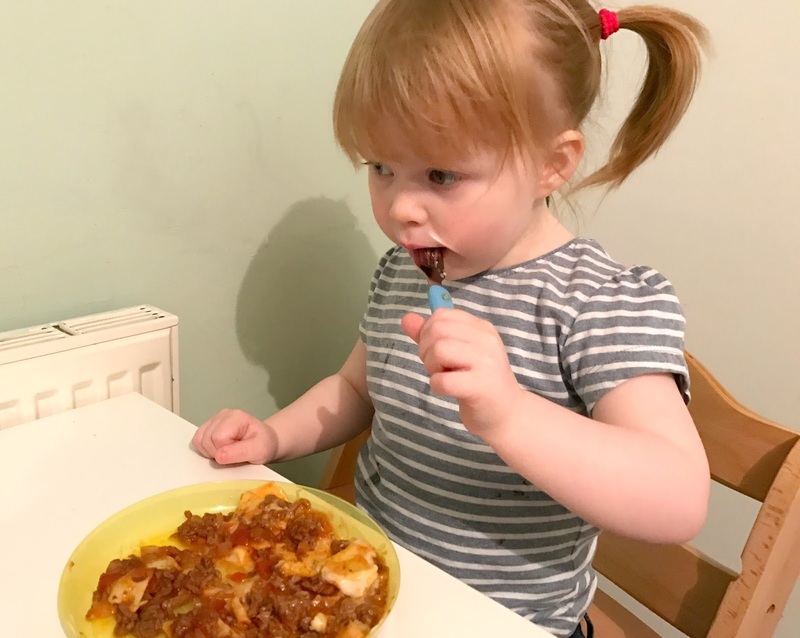 Lasagne has become one of her favourite meals, the only meal I know that I am guaranteed a clean plate! It’s also super simple to make too! I managed to make this lasagne in just a few simple steps, there is no right or wrong way to make it either. You can literally throw whatever you like in it depending on what your family likes. I simply fried off some beef mince, added diced mushrooms, courgettes, yellow peppers, and onions. Fried that for a further 3-5 minutes before adding the Bolognese sauce and letting it simmer. While that was simmering, I added a layer of the Dolmio white lasagne sauce to the bottom of my oven proof dish, added fresh egg lasagne sheets, then I began layering the lasagne. Lasagne sheet, white sauce, then the Bolognese mixture. To top it off I added some grated cheddar and baked it for 40-45 minutes (depending on how crispy you like it to be). I then served it with a side of salad and some garlic dough balls. The garlic dough balls are Emily’s favourite and I’m happy to say that she ate her whole plate! As there is only the three of us, luckily I had quite a bit of left overs, which I have popped into the fridge to have tomorrow for lunch with a side salad. I’d love to hear what your favourite Dolmio sauce is?